Birdseye devoted the end of his life to improving paper manufacture. He worked for two years on a plantation in Peru to develop a method of converting sugar cane waste into paper pulp, shortening the process from nine hours to twelve minutes. A venturesome biologist brought convenience and variety to American tables when he invented and marketed retail frozen foods. An adventurous biologist and a businessman, Clarence Birdseye devised a way to quick-freeze foods and market them to the public. Birdseye was born in 1886 in Brooklyn, New York, and grew up hunting and practicing taxidermy. After studying biology at Amherst College, he took an assortment of wildlife jobs. In 1912, he went to the northeastern Canadian province of Labrador to buy and sell fox furs. During one of the region's cold winters, he came up with the idea of flash-freezing foods. Observing the practices of the native Inuit people, Birdseye saw the preservative effects of extremely cold temperatures on fresh fish. If the fish was frozen fast enough, its cellular structure was minimally affected, and its appearance, taste, and texture were not changed. He experimented with freezing cabbages for his family to eat in the vegetable-poor winter months. Birdseye returned to the States in 1917, and eventually went into the wholesale fish business, capitalizing on his interest in quick-freezing under extremely high pressure. In 1924, he founded a company, Birdseye Seafoods, Inc., to market his flash-frozen foods such as fish, meat, and vegetables. The foods were test-marketed in Springfield, Massachusetts, in 1930, before their national roll-out. Temperature control had to be maintained from factory to point-of-purchase, so the foods went to retailers in refrigerated boxcars, and Birdseye leased retailers specially-designed freezer display cases. By the late 1940s, American consumers were buying freezers for their homes, and the convenience of frozen foods made them big sellers. Food companies soon launched more elaborate offerings: frozen hors d'oeuvres, entrees, and pizza. 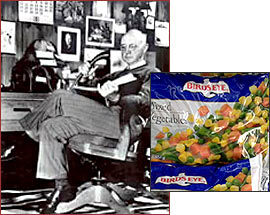 Birdseye was instrumental in bringing the food industry into the modern era. He died of a heart attack in 1956.